Around a dozen of us met last night in the comfortable surroundings of the Applegreen’s at Templepatrick. …the Charities Act (NI) 2008 does include sections relating to the creation of CIOs in Northern Ireland but these sections have not yet been commenced. These sections can only be commenced by the passing of Assembly legislation known as a commencement order but there are no present or near future plans to pass such an order in relation to CIOs in Northern Ireland. While there are other charitable structures available, it was felt at the meeting that these were more onerous and expensive. For now we agreed to look at forming an Unincorporated Association and we will work on a draft constitution document. Having an official organised association will help NIEVO cement its status as a stakeholder as we lobby for and support the promotion of Electric Vehicles and their infrastructure requirements. The ongoing deterioration of the public charging network was the subject of a lively discussion. Despite many requests, ESB eCar have not provided us with a list of the chargers they look after in Northern Ireland. While they continue to refer us to their map, it’s a non-trivial exercise to pull this data out into a list. A quick look at the map on the 05/12/17 showed at least 16 towns and cities around the province that had one or more CP reporting as out of service or out of contact (including 2 rapids): Armagh, Ballymoney, Banbridge, Belleek, Belfast, Cloughmills, Craigavon, Downpatrick, Dungiven, Glenarm, Kilkeel, Newcastle, Omagh, Strabane, Templepatrick, Toome. We had a phone call with an ESB eCar representative a few hours before the meeting and he made following points. Current Service Level – ESB eCar are using same contractors as before. Service levels are what they are, and are unlikely to change. SEMA on Street Chargers – Old equipment continues to be a major issue. The company that made these chargers is no longer in business. No spare parts are available so Motherboards have to be removed and taken away for repair. Rapid Touchscreen Issue – First touchscreen has now been repaired (Maghera) at cost of ‘several thousands’. Parts now ordered to do the rest of this model. The vast majority of our group strongly believe that the only way things will change is for payment to be required for charging. We do not think we can expect investment in the network or a guaranteed level of service for maintenance and repairs whilst there is no business model. Whether the current ESB eCars setup will turn out to be the main network, or one or more third parties enter the market remains to be seen. We hope for a future with fair and reasonable pricing and an element of competition. 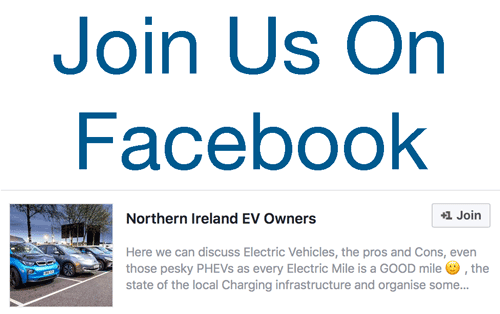 While we should all rightly point out when chargers are down (perhaps the best place to do this is on the eCar NI Facebook page), we also encourage our members to balance this with posts on the positive aspects of EV ownership. As a group one of our main aims is to promote electric motoring and encourage the uptake of EVs, constant negative posts about charging issues, while true, could serve to dissuade potential EV purchasers, whilst the vast majority of drivers rarely need to use the public network on a regular basis. It was noted that the growth in plug in capable cars in Northern Ireland is dramatic. 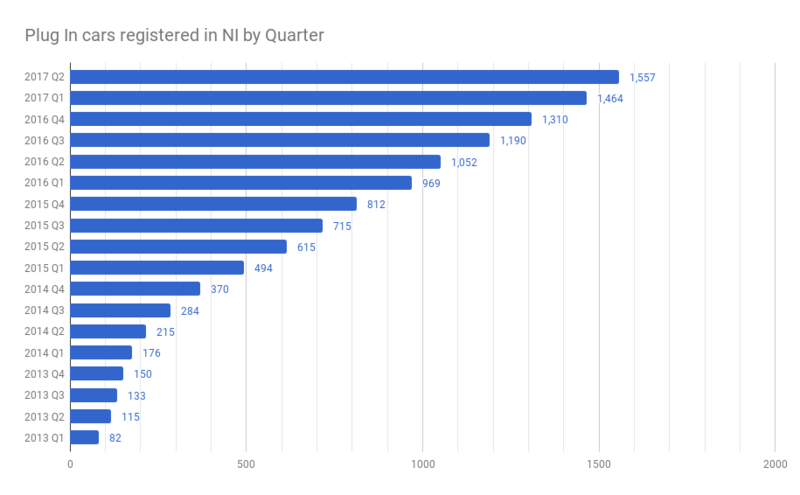 In 2013 there were only 82 registered Plug in capable cars, by second Quarter 2017 the number is 1557, a huge increase and it appears its only going to continue at this pace. The volume of EVs alone should be a driver for change in terms of the availability and reliability of the public charging network. Another discussion point was how we can further promote the group, should we, for instance, affix NIEVO cards to all chargers for new drivers to gain awareness of our group. This could be facilitated by our members, who when visiting chargers could affix the cards if they aren’t already in place. We are more than happy to investigate other ideas as suggested by our members and we did get a couple of other ideas during the discussion. Other topics were discussed during the meeting including OLEV grants for local authorities to install chargers and the new forecourt Electric Vehicle rapid charging service announced by Shell. NIEVO will take these items forward and attempt to find out more on behalf of our members. Be the first to comment on "NIEVO Meet #4 Report: Group Structure and Public Charger Network"